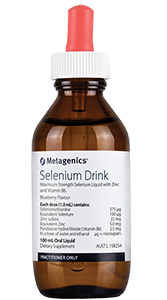 Selenium Drink is formulated specifically to support healthy hormone production, to help enhance immunity and to protect tissues from oxidative stress. Selenium is an essential mineral intimately involved in various enzymatic processes, including thyroid hormone synthesis, activation and metabolism. 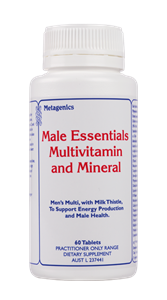 Zinc and vitamin B6 are critical cofactors essential to healthy immune responses, the modulation of hormones and normal metabolic rate. This blueberry flavoured liquid supplement allows for easy, convenient prescribing of these key nutrients. In a base of purified water and ethanol. Directions: Take 1mL diluted in 100 to 200 mL water or juice once daily with food. Potent antioxidant protection. 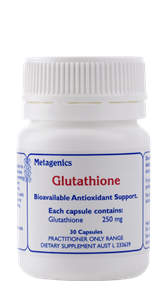 Selenium is an integral part of several important antioxidant proteins, including glutathione peroxidase and thioredoxin reductase. These are involved in the regulation of reactive oxygen species. Also an important component of the antioxidant defense network is zinc. Zinc helps to prevent membrane oxidation and acts with lipid and water-soluble antioxidants in the protection of lipid oxidation. Promotes normal immune function: Selenium, zinc and vitamin B6 are essential to healthy immunity, strengthening the healing process and providing antioxidant support. Selenium is shown to have several immune-enhancing benefits, such as supporting phagocytic activity and lymphocyte activation, proliferation, and differentiation. 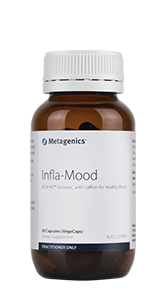 Zinc plays various important roles in immunity, including supporting T-lymphocyte generation, as well as supporting development and the function of T-helper cells, natural killer cell activity, innate inflammation and neutrophil activation. Supports healthy hormone production: Selenium is an essential cofactor in iodine metabolism, thyroid hormone production and in the peripheral conversion of thyroxine (T4) to tri-iodothyronine (T3) – the body’s primary hormonal regulator of metabolism, normal growth and development. Adequate zinc intake has also been shown to be associated with normal healthy thyroid hormone metabolism and basal metabolic rate, by supporting serum free T4 and normal thyroid stimulating hormone (TSH) levels. Cautions: Do not take undiluted, as this may lead to gastric upset and nausea. WARNING: This product contains selenium which is toxic in high doses. A daily dose of 150 mcg for adults of selenium from dietary supplements should not be exceeded.